Back in May I set out some thoughts on what the diatom-based metrics that we use for ecological assessment are actually telling us (see “What does it all mean?”). I suggested that diatoms (and, for that matter, other freshwater benthic algae) showed four basic responses to nutrients and that the apparent continua of optima obtained from statistical models was the result of interactions with other variables such as alkalinity. However, this is still only a partial explanation for what we see in samples, which often contain species with a range of different responses to the nutrient gradient. At a purely computational level, this is not a major problem, as assessments are based on the average response of the assemblage. This assumes that the variation is stochastic, with no biological significance. In practice, standard methods for sampling phytobenthos destroy the structure and patchiness of the community at the location, and our understanding is further confounded by the microscopic scale of the habitats we are trying to interpret (see “Baffled by the benthos (1)”). But what if the variability that we observe in our samples is actually telling us something about the structure and function of the ecosystem? One limitation of the transfer functions that I talked about in that earlier post is that they amalgamate information about individual species but do not use any higher level information about community structure. Understanding more about community structure may help us to understand some of the variation that we see. 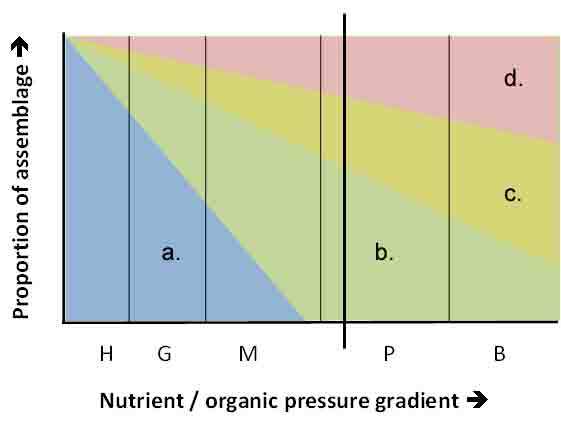 In the graph below I have tried to visualise the response of the four categories of response along the nutrient/organic gradient in a way that tries to explain the overlap in occurrence of different types of response. I have put a vertical line on this graph in order that we can focus on the community at one point along the pollution gradient, noting, in particular, that three different strategies can co-exist at the same level of pollution. Received wisdom amongst the diatom faithful is that the apparent variation we see in ecological preferences amongst the species in a single sample reflects inadequacies in our taxonomic understanding. My suggestion is that this is partly because we have not appreciated how species are arranged within a biofilm. I’ve tried to illustrate this with a diagram of a biofilm that might lead to this type of assemblage. Schematic diagram showing the response of benthic algae along a nutrient/organic gradient. a.: taxa thriving in low nutrient / high oxygen habitats; b.: taxa thriving in high nutrient / high oxygen habitats; c.: taxa thriving in high nutrient / low oxygen habitats; d.: taxa thriving in high nutrients / very low oxygen habitats. H, G., M, P and B refer to high, good, moderate, poor and bad ecological status. The dominant alga in many of the enriched rivers in my part of the world is the tough, branched filamentous green alga Cladophora glomerata. This, in turn, creates micro-habitats for a range of algae. Some algae, such as Rhoicosphenia abbreviata, Cocconeis pediculus and Chamaesiphon incrustans, thrive as epiphytes on Cladophora whilst others, such as C. euglypta are often, but not exclusively, found in this microhabitat. Living on Cladophora filaments gives them better access to light but also means that their supply of oxygen is constantly replenished by the water (few rivers in the UK are, these days, so bereft of oxygen to make this an issue). All of these species fit neatly into category b. in my earlier post. Underneath the Cladophora filaments, however, there is a very different environment. The filaments trap organic and inorganic particulate matter which are energy sources for a variety of protozoans, bacteria and fungi. These use up the limited oxygen in the water, possibly faster than it can be replenished, so any algae that live in this part of the biofilm need to be able to cope with the shading from the Cladophora plus the low levels of oxygen. Many of the species that we find in highly polluted conditions are motile (e.g. Nitzschia palea), and so are able to constantly adjust their positions, in order to access more light and other resources. They will also need to be able to cope with lower oxygen concentrations and, possibly, with consequences such as highly reducing conditions. These species will fit into categories c. and d. in the first diagram. 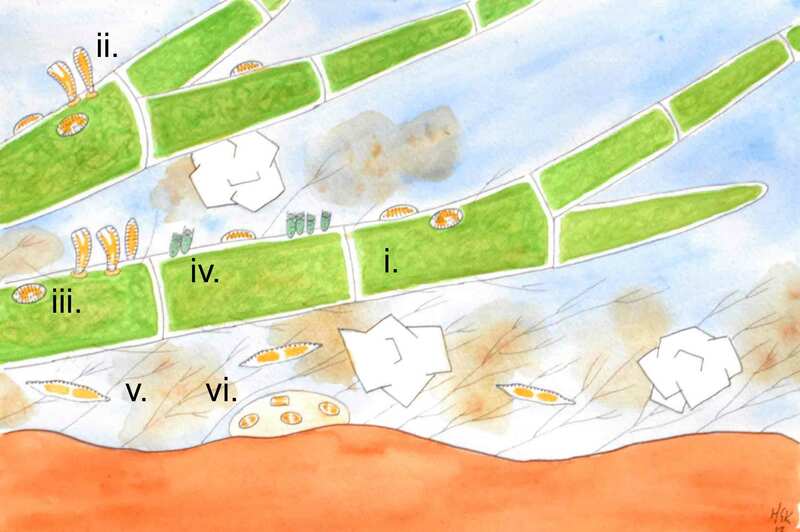 A stylised (and simplified) cross-section through a biofilm in a polluted river, showing how different algae may co-exist. The biofilm is dominated by Cladophora glomerata (i.) with epiphytic Rhoicosphenia abbreviata (ii. ), Cocconeis euglypta (iii.) and Chamaesiphon incrustans (iv.) whilst, lower down in the biofilm, we see motile Nitzschia palea (v.) and Fistulifera and Mayamaea species (vi.) growing in mucilaginous masses. However, as the cross-section above represents substantially less than a millimetre of a real biofilm, it is almost impossible to keep apart when sampling, and we end up trying to make sense of a mess of different species. The ecologists default position is, inevitably, name and count, then feed the outputs into a statistical program and hope for the best. A final complication is that river beds are rarely uniform. The stones that make up the substrate vary in size and stability, so some are rolled by the current more frequently than others. There may be patches of faster and slower flow associated with the inside and outsides of meanders, plus areas with more or less shade. As a result, the patches of Cladophora will vary in thickness (some less stable stones will lack them altogether) and, along with this, the proportions of species exhibiting each of the strategies. The final twist, therefore, is that the vertical line that I drew on the first illustration to illustrate a point on a gradient is, itself, simplistic. As the proportions vary, so the position of that line will also shift. Any one sample (itself the amalgamation of at least five microhabitats) could appear at a number of different points on the gradient. Broadly speaking, uncertainty is embedded into the assessment of ecological status using phytobenthos as deeply as it is in quantum mechanics. We can manage uncertainty to some extent by taking care with those aspects that are within our control. However, in the final analysis, a sampling procedure that involves an organism 25,000 times larger than most diatoms blundering around a stream wielding a toothbrush is invariably going to have limitations. The same schematic diagram as that at the start of this article, but with the vertical line indicating the position of a hypothetical sample replaced by a rectangle representing the range of possibilities for samples at any one site. This entry was posted in ecological assessment and tagged biofilms, diatoms, ecological assessment, rivers. Bookmark the permalink.